Susan Merrill Squier, Ian Williams, Morgan Sea, Rachel Lindsay and more presented at the second day of the Graphic Medicine Conference in Vermont. The big news of the Graphic Medicine Conference came Friday evening, at Susan Merrill Squier’s keynote address: Graphic Medicine is going to seek 501(c)(3) status, making it officially a nonprofit organization. When co-director Ian Williams told me this the next day, I thanked him -— up until now, I haven’t ever been sure what noun to use to describe Graphic Medicine. Is it a movement? A community? Now it will be a nonprofit organization, although there are still many details to be hammered out. 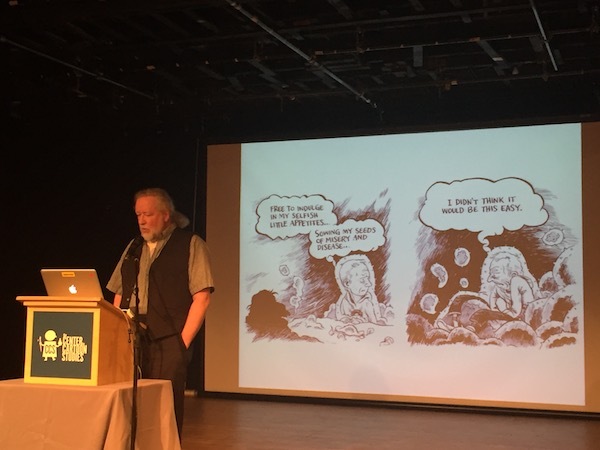 Brigid Alverson reports from the scene of the 2018 Graphic Medicine Conference in Vermont, which is focused on graphic novels that describe the experience of illness and of being a patient. I’m up in White River Junction, Vermont, home of the Center for Cartoon Studies and, for this weekend only, the Graphic Medicine Conference. Actually, the conference has two venues—it starts at CCS and moves to the Dartmouth medical school on Saturday.